Practical Art is turning eight! When Practical Art opened, we carried the functional, imaginative work of eight (fitting, right?) local artists. Over the past eight years, we have expanded our network of artists to more than 130– and we are still growing. We jury new artists into the store every month, which means you can always find something fresh and innovative on our shelves! At Practical Art we pride ourselves in finding art in the everyday– which is why we feature work that is beautiful, and usable! The truth is, it is more fun to drink your morning cup o’ joe from a Jillian Schimmel Arizona mug, roll out your favorite pie dough with a Paul Porter rolling pin, or sign your name with a hand-turned Richard Altenhofen pen. Practical Art also features fine art in our monthly wall shows. Have you been by to see Lara Plecas’s encaustic pieces in her show, “We Shall Be Free…”? Here at Practical Art, if you need something boxed or bagged, we are happy to oblige– but don’t be surprised if you walk out with a child’s birthday bag, or Tiffany & Co. box. All of our packaging comes from community donations. Next time you celebrate a birthday or go on a shopping trip, don’t throw your bags and boxes away! Bring them to Practical Art and we will put them to re-use. Last year, Practical Art raised more than $10,000 in support of 12 different local non-profits around the valley– and we are on pace to do even more this year! Our monthly Charity Pie Night highlights organizations around the state that are working hard to improve our community. Our next Charity Pie Night happens April 22nd! Come by to hear about the great work of the Phoenix Zoo, meet some adorable critters, and eat delicious pie! At Practical Art we consider ourselves experts of all things local. 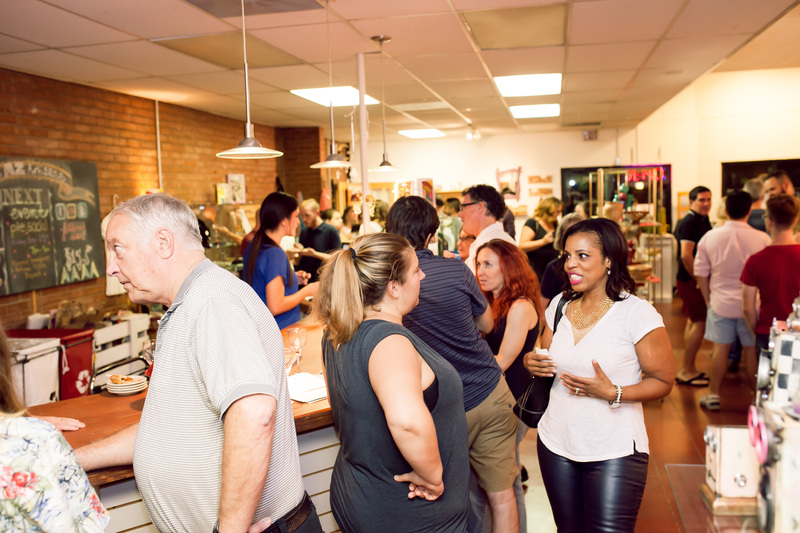 Our staff is proud to direct you to other local shops and eateries around the Phoenix area, including Bunky Boutique, Frances, Changing Hands Bookstore, For the People (our new neighbors! ), Windsor, Short Leash Hotdogs, or Southern Rail. As proud members of Local First Arizona, we know that supporting local shops improves the economy in Phoenix. At the national level, local businesses reinvest, on average, 64.8% back into their local community, as compared to 33.6% from national chains. At Practical Art, we know that our numbers are even higher. When you shop at our store, more than 70% will be reinvested back into our local community. Practical Art conducts workshops and special events in which our customers get the chance to become the artist. Past workshops have included the opportunity to cut wine bottles with Ray Del Muro and turn them into vases, creating your own candle scent with Standard Wax, or paint pottery with Jillian Schimmel. This month we have an Ice Dyeing workshop happening with Lara Plecas on April 30th (click here to find out more)! Keep your eyes peeled for class schedules and workshop updates on our website and in our monthly newsletter– we have some exciting events planned for this summer! We love the variety of sights, sounds, and smells that you will experience when you walk in our doors. Don’t be surprised if you are confronted by scent of creosote, care of Silver Lining Soaps, or bergamot from our Standard Wax candles. We hope you relish in our recycled and refurbished cases salvaged from other businesses, or the newly reinvented shelves and tables handcrafted by our artists. Enjoy the myriad of textures represented by our artists: feel the silky smooth glass constructed by Marnie Brookins, the grain of Greg Corman’s wooden vessels, or the soft cushion of Elsie Leutwyler’s nits. Experience something new with each visit, and know that each experience has been hand-crafted by local artists, just for you! Live out of state? Moving out of town? Don’t have time to come down to the shop before your best friends wedding? No problem! You can still purchase one-of-a-kind, Practical Art pieces on our web-store. Find a great selection of your favorite artists work at www.practical-art.com. We are happy to ship (for FREE during the month of April)! We want to send a huge THANK YOU to the local community who has continued to support our shop and the amazing artists that we represent. In honor of our wonderful customers, we’ve put together a birthday goodie bag– one that highlights the best of our shop! Inside this ‘bag’ you will find Alex Ozer earrings, a Lisa Olson original photograph, Carolyn Camp’s Silver Lining soap, and more! How do you get your hands on this one-of-a-kind goodie bag!?! Purchase a raffle ticket online or come into Practical Art today and purchase a celebratory 8th birthday raffle ticket for $8.00. We will draw the winning name at the end of this month! From the bottom of our hearts thank you for helping us build a beautiful space that supports local artists & the Phoenix community. We can’t wait to see you soon! Posted on April 12, 2016 April 12, 2016 Categories About Us, UncategorizedTags arizona, art, artisan, artist, artist studio, az, azart, ceramic, charity, charity pie night, clay, craft, exhibition, functional art, fundraiser, gallery, gift, gift guide, giving, handmade, holiday, Karen Olson, local, local art, Local First Arizona, phoenix, phxart, phxarts, pie, pottery, Practical Art, sculpture, shop local, space boy robot, studio visit, Vonceils pies, wine, wood1 Comment on Practical Art is turning eight! Practical Art’s 2015 Holiday Extravaganza! Twas the month before Christmas and all through the great metropolitan of Phoenix, not a creature wanted to miss out on Practical Art’s HOLIDAY EXTRAVAGANZA!! Don your favorite holiday sweater and join us at Practical Art this Friday, December 4, 2015,from 6:00pm-10:00pm. 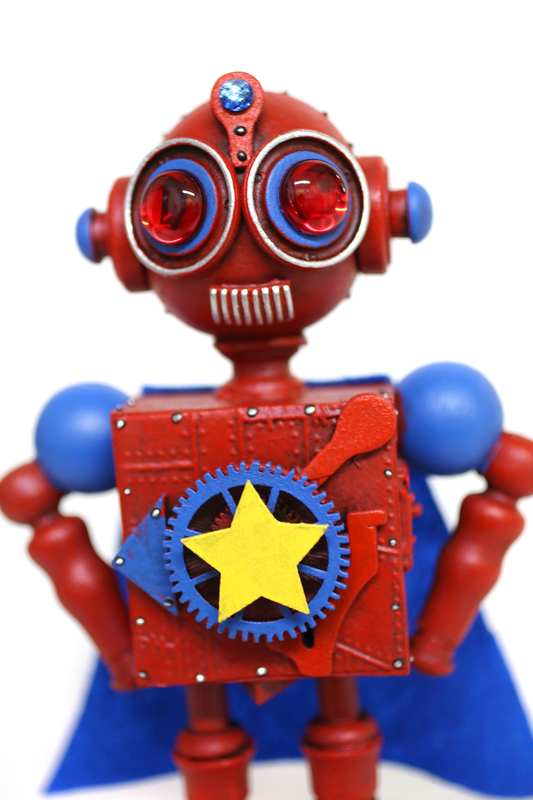 Only at Practical Art will you get to make ROBOT ORNAMENTS with our local robot expert, Jordan Alexander Thomas. Then watch live as December’s featured wall artist, Jesse Perry, demonstrates how he creates his painted street art. Listen to carolers sing your favorite holiday tunes as you munch on delectable holiday treats. Browse through the work of Practical Art’s 130 artists and peruse Bunky Boutique’s ‘Pop-up-shop’ to find the perfect one-of-a-kind gifts for every person on your list. Document all of your merry-making with our polaroid camera photo ops! And when you work up an appetite after participating in all of these festivities, you can scrumptious tacos from Paz Cantina’s (one of our favorites!). Still looking for more local love? Walk from Practical Art over to Crafeteria to explore even more local art and shops. Bring your friends, your spouse, your grandparents, your kids, your neighbors– everyone! This Friday will be a night to remember and we can’t wait to see you there! Posted on December 4, 2015 December 4, 2015 Categories EventTags arizona, art, artisan, artist, artist studio, az, azart, azarts, bunky boutique, ceramic, Christmas, crafeteria, craft, December, exhibition, frances, functional art, gallery, gift, giving, handmade, holiday, Holiday Party, holiday shopping, jesse perry, local, local art, painting, Paz Cantina, phoenix, phxart, phxarts, Practical Art, robot, shop local, space boy robot, woodLeave a comment on Practical Art’s 2015 Holiday Extravaganza! October Charity Pie Night benefiting Rising Youth Theatre! Here at Practical Art, we strongly believe in the transformative and community–building power of art. Hence, we strive to bring art into the everyday. Luckily, we are not alone in this mission. Organizations, such as Rising Youth Theatre work hard to bring incredible artistic experiences to the youth and the community— which is why we are excited to feature them this Friday from 7:00pm – 9:00pm during the most scrumptious night of the month, Charity Pie Night! This quote demonstrates the core of Rising Youth Theatre’s mission statement: to create youth driven theatre that is riveting and relevant, challenging audiences to hear new stories, start conversations and participate in their communities. Through participation on stage, behind the scenes, or in the audience, children, teens, and adults are exposed to innovative ways of thinking and asking questions about the world around us. The result is thoughtful, engaged citizens. Karen Olson of Vonceil’s Pies will bring her own artistic creations to share, as we celebrate the work of this wonderful organization. Share in a slice, or try a sampling of each unique and delicious flavor as you discuss why the arts are so important to you. We can’t wait to see you there! Featured charity: Rising Youth Theatre! A $5 donation gets you a slice of a Vonceil’s Pies creation! A $10 donation gets you as many in-house tastings as you’d like! All donations, and 10% of all sales that day, will be donated to Rising Youth Theatre! Posted on October 22, 2015 Categories UncategorizedTags arizona, art, artisan, azart, azarts, baker, ceramic, charity, charity pie night, donation, functional art, fundraiser, gallery, giving, handmade, Karen Olson, local, local art, Local First Arizona, phoenix, phxart, pie, Rising Youth Theatre, space boy robot, Vonceils piesLeave a comment on October Charity Pie Night benefiting Rising Youth Theatre! handcrafted by Practical Art artisan Jordan Alexander Thomas! 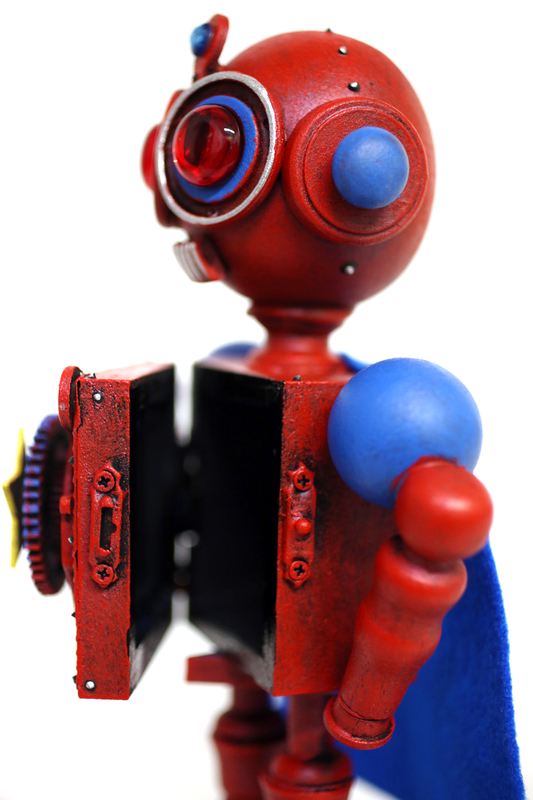 Yeah, this robot, “Super Star”, is a crafty fella– don’t let his adorableness deceive you. NOT ONLY is he made completely out of wood, but… dun dun dunnnn….. he has a secret compartment! For what? Only you know, and that’s entirely the point.